Open your mind, it's beautiful inside. Rest here for a minute...it's ok.
We all understand that stress from hectic schedules, family demands, grief, fear for our community and world can add weight to the tension we carry with us every day. At Copper Well Retreat we offer our guests spirit-focused body rituals designed to lighted that load and renew the spirit to a fresh sense of peace. 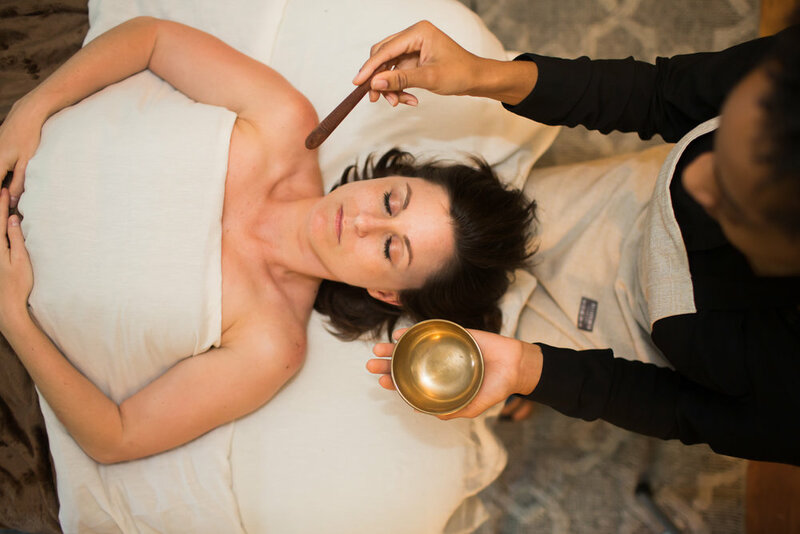 Combining the ancient wisdom of Ayurveda medicine and the modern techniques of Neuromuscular Massage and Bodywork, we've created 2 unique Copper Well Retreat exclusive experiences certain to unbind your spirit. This luxuriant experience is our unique take on the ancient body service of 'Shirodhara (meaning head-bliss)', part of the Ayervedic therapy of Panchakarma. Recommended treatment is for those undergoing excessive stress or grief. Deeper than normal relaxation is often reached as a result of the binaural sedation. 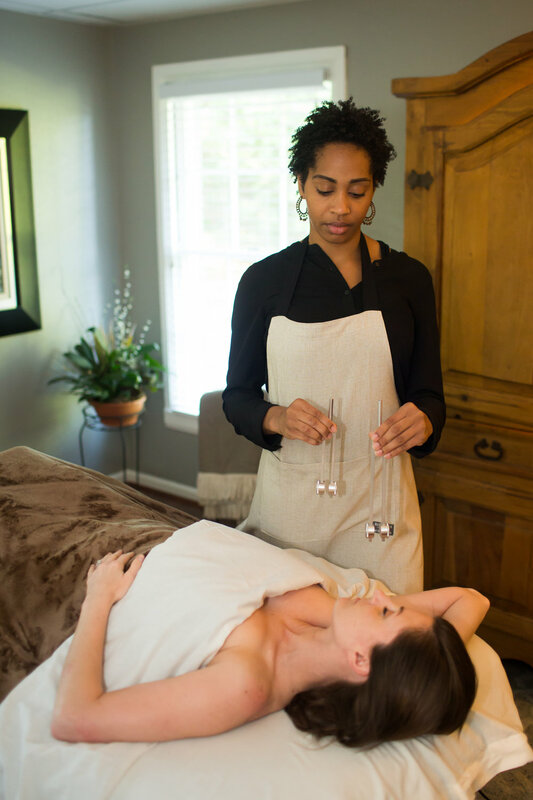 Warm therapeutic oil is transferred into a pendulum vessel and suspended from a copper frame overhead. A gentle stream of oil is slowly poured back and forth over the head while the therapist applies reflexology to the hands & feet. Afterwards a head, neck and abdominal massage is given to further unwind the body's digestive tension. This synergistic experience includes approaching the body's chakra zones to open blocked areas of tension and release the body's natural energetic flow, resulting in a more harmonious balanced feeling. The service begins with a sound bath using a combination of Quartz crystal singing bowls tuned to the 7 chakra zones, Tibetan brass bowls and tuning forks. Next lymph and dead skin are carried away using a dry brush technique., followed by therapeutic massage, Reiki and Chakra balancing essential oils lovingly applied to the your body. Which of the 3 doshas are you? Energy that controls bodily functions associated with motion, including blood circulation, breathing, blinking and your heartbeat. Creative; Quick to learn and grasp new knowledge, but also quick to forget, Slender; Tall and a fast-walker; Tendency toward cold hands and feet, discomfort in cold climates; Excitable, lively, fun personality; Changeable moods; Irregular daily routine; High energy in short bursts; Tendency to tire easily and to overexert; Full of joy and enthusiasm when in balance; Responds to stress with fear, worry, and anxiety, especially when out of balance; Tendency to act on impulse; Often have racing, disjointed thoughts; Generally have dry skin and dry hair and don't perspire much. Energy that controls the body's metabolic systems, including digestion, absorption, nutrition and your body's temperature. Medium physique, strong, well-built; Sharp mind, good concentration powers; Orderly, focused; Assertive, self-confident, and entrepreneurial at their best; Aggressive, demanding, pushy when out of balance; Competitive, enjoy challenges; Passionate and romantic; Strong digestion, strong appetite, get irritated if they have to miss or wait for a meal; When under stress, Pittas become irritated and angry; Skin fair or reddish, often with freckles; sunburns easily; Uncomfortable in sun or hot weather, heat makes them very tired; Perspire a lot; Good public speakers; Generally good management and leadership ability, but can become authoritarian; Subject to temper tantrums, impatience, and anger; Typical physical problems include rashes or inflammations of the skin, acne, boils, skin cancer, ulcers, heartburn, acid stomach, insomnia, dry or burning eyes. Energy that controls growth in the body. It supplies water to all body parts, moisturizes the skin, and maintains the immune system. Easygoing, relaxed, slow-paced; Affectionate and loving; Forgiving, compassionate, nonjudgmental nature; Stable and reliable; faithful; Physically strong and with a sturdy, heavier build; Have the most energy of all constitutions, but it is steady and enduring; Slow speech, reflecting a deliberate thought process; Slower to learn, but outstanding long-term memory; Soft hair and skin; tendency to have large "soft" eyes and a low, soft voice; Tend toward being overweight; may also suffer from sluggish digestion; Prone to depression; More self-sufficient; Gentle, and essentially undemanding approach to life; Excellent health, good immune system; Very calm; strive to maintain harmony and peace in their surroundings; Not easily upset and can be a point of stability for others; Tend to be possessive and hold on to things. Don't like cold, damp weather; Physical problems include colds and congestion, sinus headaches, respiratory problems including asthma, allergies, and atherosclerosis (hardening of the arteries). Stress shrinks the brain! Extreme stress events (divorce, loss, grief) reduce grey matter regions in the brain tied to emotional and psychological functions which can lead to future psychiatric problems. 3 out of 4 doctor's visits are for stress-related ailments. Work stress causes 10% of strokes. 44% of stressed people loose sleep every night. 40% of stressed people overeat.